If the Hurricanes are to snap the longest post-season drought in the NHL, they'll need to rely on some underrated offensive weapons, strong defense and a bounce back season from their tandem of masked men. 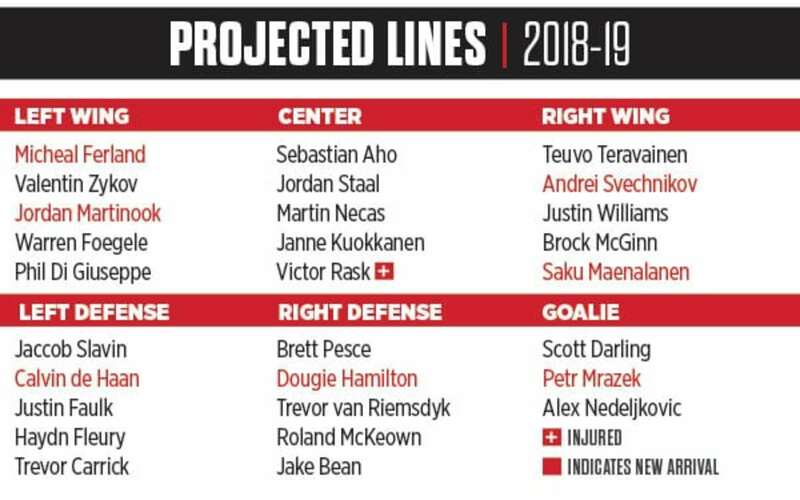 The Hockey News’ 2018-19 Season Preview series dives into off-season transactions, best- and worst-case scenarios and one burning question for each team in reverse order of Stanley Cup odds. Carolina was largely sunk by goaltending and defense last year and changes have been made in both departments. Petr Mrazek may be streaky, but if he can bring the good parts of his game to the Hurricanes, it will push Scott Darling while also netting the team some valuable wins. On defense, Dougie Hamilton is an immediate upgrade on Noah Hanifin (long-term is a matter of debate) and adding him to a core that includes Jaccob Slavin, Brett Pesce and Justin Faulk makes the blueline better. Up front, the Canes are led by the young and talented Sebastian Aho and Teuvo Teravainen, as well as two-way threat Jordan Staal. If center Martin Necas can crack the roster and do damage, Carolina has another scoring-line option down the middle. Plus, right winger Andrei Svechnikov has Calder Trophy potential and brings a big body to the attack. With Rod Brind’Amour behind the bench, the Canes have a coach who bleeds red and black. His familiarity with the organization helps the transition from Bill Peters. With so much uncertainty in the division, Carolina can ride these factors into a playoff spot, which would be the team’s first since 2009. There’s a very real possibility Mrazek just isn’t consistent enough to be anything more than a backup in the NHL. If true, Carolina risks having one of the worst goaltending tandems in the league and not enough offense to bail them out. The Canes don’t have a No. 1 center on their roster. Staal has the pedigree, but has never surpassed 50 points. Necas is probably a No. 2 at best and it’s no sure thing he can take on big minutes yet. Victor Rask has fallen off a cliff and is sidelined well into the season after an injury in the kitchen (seriously), Elias Lindholm was sent to the Flames in the Hamilton/Hanifin deal, Jeff Skinner was traded to Buffalo and even Derek Ryan left for Calgary. The defense was underwhelming last season and as good offensively as Hamilton is, he’s also developing a reputation as a chemistry killer. How will that affect a team that isn’t flush with good vibes right now? Brind’Amour is a rookie coach and if recent history is any indicator, his first year will be tough – Year 2 is when new coaches get their sea legs. New owner Tom Dundon is already looking like Eugene Melnyk South after several unpopular decisions. The worst-case scenario? Carolina misses the playoffs again and Canes fans are too broken to care anymore. Which Scott Darling shows up in Year Two? It’s easy to pick on the netminders. Doesn’t mean we shouldn’t do it, though. Last season, his first with the Hurricanes, hopes and expectations were high for Darling, who was coming to Carolina to be the savior between the pipes. His combined .923 save percentage across three seasons with the Chicago Blackhawks were supposed to be an indication of his ability to bring stability to a crease in dire need of anything that resembled league-average goaltending, and his playoff heroics in 2014-15 were seen as proof that he could perform under pressure. Turns out, none of that was true in Darling’s first season. He stunk up the net in Carolina, to the extent that since-departed veteran Cam Ward was relied upon just as heavily as the goaltender who was supposed to be his long-term replacement. Darling’s .888 save percentage was dreadful, his 3.18 goals-against average among the league’s worst and every underlying stat is unflattering. That said, Darling knows a little something about bouncing back when everyone is down on him. His career once appeared all but over only for him to climb from the depths of the minor leagues to become a respected NHL backup. At 29, Darling is no longer a pup, but he’s shown he’s capable of much more than the numbers he posted last season. If he bounces back in a big way — and Hurricanes fans are praying he can — he could be a prime candidate for the Masterton Trophy. THE HOCKEY NEWS’ PREDICTION: 5th in the Metropolitan Division. Let’s have some faith in Darling, and let’s also expect some big things from Sebastian Aho and Teuvo Teravainen, a dynamic duo who strutted their stuff on the World Championship stage with Finland. There’s some sneaky good offense in Carolina and enough defensive strength that the Hurricanes could surprise. Want more Season Previews? The Hockey News has you covered. Click here.